The Silversmith Hotel Chicago Downtown is home to 4,400 square feet of meeting and event space with a variety of flexible floor plans. All catering for our meeting & event space is from our restaurant Adamus, prepared by Executive Chef Nelson Erazo. Whether you're hosting a corporate or association meeting, a reception or private event, the staff of Silversmith Hotel Chicago Downtown will strive to accommodate your needs for a successful event. The largest event space of the Silversmith Hotel Chicago Downtown is the Palladium/ Rhodium. With 10 ft. tall ceilings, this is a truly grand room at 1,320 sq. ft.. 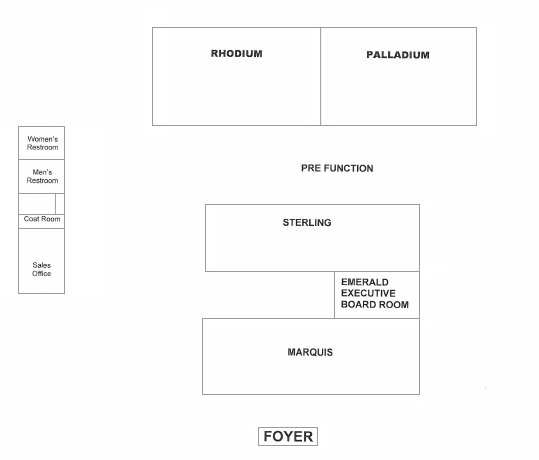 The Palladium/ Rhodium can be configured into several other floor plans, including banquet, theater, and classroom. It can also accommodate up to 100 in a reception setting. This room can also be divided into two venues, the Palladium and the Rhodium. Divided, each room is 660 sq. ft. and can accommodate all the configurations above as well as U-Shape and hollow square arrangements. At 550 square feet each the Sterling and Marquis are ideal for business meetings as well as private events. The room can be arranged into a hollow square, theater, classroom, or U-Shape. Catering, audiovisual equipment, and the expertise of our planners are all available. Up to 35 people can be accommodated in a reception setting in each room. Like the other meeting venues of the Silversmith Hotel Chicago Downtown, the Executive Boardroom boasts 10 ft. ceilings. A superb choice for meetings and conferences, the Executive boardroom is 252 square feet, and can accommodate 12 people. *All meeting rooms have a height of 10 Ft.